As installers and distributors know all too well, the tiniest differential when measuring metal panels for installation can mean success or failure. Close just isn’t good enough. That’s where a micrometer—a precision tool used for measurement accuracy—comes in. But how can you be sure the panels purchased for a project don’t exactly live up to their stated specifications or fit within a gray area that may seem minimal, but ends up causing problems when actually applied to a structure? In a previous blog post, we discussed the importance of knowing the thickness (gauge) of your metal panels to ensure you know how to choose the correct thickness of the metal panels you choose to use on a project. This is important because you can easily find panels from different manufacturers that—while labeled with the same gauge measurement—can actually vary greatly in the actual thickness of the metal sheeting, creating a noticeable difference in panel stiffness and strength. Since the labels on the panels don’t tell the entire story, using a micrometer to measure the exact thickness of the panels is a sure-fire way to know what you’re paying for. From the Greek, the word micrometer’s literal meaning comes from micros (small) and metron (measure). The tool, sometimes known as a micrometer screw gauge, is used to achieve precise, fine measurements of very small distances or thicknesses. Each of its two faces can be moved away from or toward the other by turning a screw with a fine thread. The precision device incorporates a calibrated screw (or thread), which is found internally on the spindle, and is usually in the form of calipers. Available in both metric and imperial versions, a micrometer (often shortened to mike or mic) usually, but not always, takes the form of calipers (opposing ends joined by a frame). The device’s spindle is an accurately machined screw. When used to measure a metal panel, the sheet is placed between the tool’s spindle and anvil. The spindle is moved by turning the ratchet knob or thimble until the sheet is lightly touched by both the spindle and the anvil. Metric micrometers typically measure in 0.01mm increments and imperial versions in 0.001 inches. Assuming the user takes great care, micrometers can provide more accurate measurement than other measuring devices (ex. : dial calipers, vernier calipers). Micrometers are widely used not only for metal panel measurement, but also in other mechanical engineering areas where precise measurement of components is advised. Micrometers have two scales: a primary scale located on the barrel (sleeve) and a secondary scale, which is located on the thimble. Values are derived from both scales and combined to come up with the total measurement. As the spindle completes its revolution, the space between the spindle and the anvil (the measuring faces) is adjusted by the smallest values that can be represented on the primary sleeve scale (0.5mm for metric micrometers; 0.025 for imperial versions). 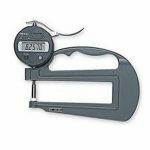 As a specialized engineering tool, micrometers are available from a variety of industrial equipment companies. Numerous brands and types are available in the market to meet particular needs, including specific applications or budgets. Additionally, feel free to reach out to a metal panel manufacturer for their recommendation on the best micrometer to use to measure metal roof and wall panels as well as for specific measurements on the panels they offer.